Adams says they’ve whitened her teeth and eyes and added color to her lips and cheeks. The Woman’s Day photograph has also been sharpened, which Adams says is completely unnecessary. “Sometimes in newsprint we sharpen images because they soften in print, but magazines print on gloss so there’s no need to do that,” says Adams. 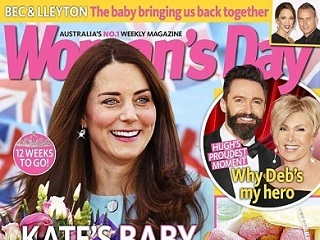 D.C.-based UPI writer Veronica Lenares thinks the Woman’s Day handiwork may constitute “one of the most unflatering pictures” of the Duchess ever circulated. Ouch! To view the original and far more flattering shot of Middleton, click here.